Leave it to Taqueria 27 to create the perfect sweet ending to its fresh-made Latin American street food that’s all the rage these days. Now with five locations along the Wasatch Front, the chain is locally owned and operated by husband-and-wife team, Todd and Kristin Gardiner, who, despite their rapid growth, continue to focus on sourcing local ingredients and growing their own produce as much as possible. For the past 25 years, Todd has been honing his skills at popular Utah eateries including Log Haven, Snowbird’s Aerie and Z’Tejas, formerly of the Gateway. Known for chef-created tacos and inspired versions of guacamole, Taqueria 27 serves up daily specials that showcase seasonal ingredients as well as an assortment of Taqueria 27’s signature margaritas made with fine tequilas. Taqueria 27’s churros—or T27 Donuts, as they’re called—are long, fluted deep-fried sticks of dough. Churros are traditional in Spain and Portugal, where they are normally eaten for breakfast and dipped in champurrado (a Mexican hot chocolate and corn drink), hot chocolate, dulce de leche or café con leche. Sugar is often sprinkled on top. The bakers at Taqueria 27 use a gluten-free flour for their pastries. As such, it’s a made-from-scratch dessert that can easily be enjoyed by all. A plate of donuts includes four pastries with grooved ridges, stacked criss-cross style. They arrive at the table hot and crispy, sprinkled with a cinnamon-sugar mixture that includes finely grated Mexican chocolate. 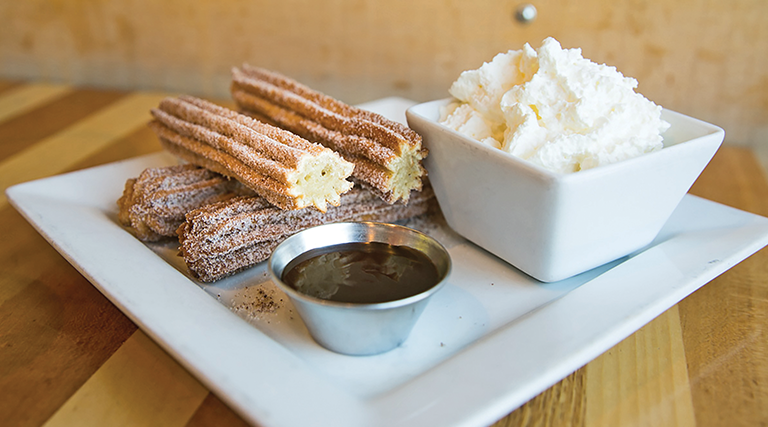 A bite into the churro reveals a delicacy with a sweet, tender interior. Accompanied by bowls of light, airy whipped cream and a rich Ghirardelli Chocolate Sauce, the donuts are perfect for sharing and dunking.